Coral Reef tank and experience all the abundant life from a perspective only a few ever get to experience. Led by our professional dive staff, participants will be taught the basics of Aquarium diving before taking the plunge into our world of rays, sharks, and 90 species of fish. As you swim amongst these fascinating creatures, you will also learn the role divers can play in reef conservation and how to be a steward of our precious natural resources. On dive days there are two scheduled start times to choose from 2:45pm or 3:45pm. There is a one hour classroom session where we will learn about the aquarium, its conservation message, the animals we will see, and the basic guidelines in using the facility. We will then brief at the exhibit, get ready to dive, and then hop into the water with over 900 fish! You would have to travel around the globe to experience a day of diving like this, but with this fun-filled experience you can have it all right here in your own backyard! If it's been a while since your last dive, we highly recommend a refresher course prior to your dive. The aquarium is a confined space and proper buoyancy control is a required skill in order to make the dive. Dive with us in the National Aquarium! Just pick a date and location from our list and we’ll email you a eLearning code and information during our normal business hours Monday through Saturday. If your plan is to complete your Open Water Training Dives locally, the dives are usually conducted at Hyde’s Quarry in Westminster, Maryland. Training dives take place on a Saturday and Sunday where you will complete two dives each day for a total of four open water dives. Cost of all four training dives is $NNN. Do you want to get a certification for your drive? You have an option to receive the PADI Aquarium Diver Distinctive Specialty. 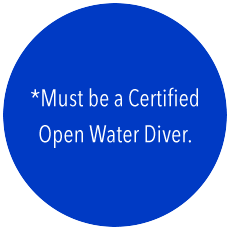 This certification would count towards Master Scuba Diver if you ever expect to aspire to the highest rating in diving. There is an additional $00 charge for this certification.